Skin burns are very common and at some points in our lives, we all have to experience this. Among the causes of burn injury can be gotten through hot or boiling water, fire, heat, sunburns, chemicals, radiation, and electricity. First degree : 1st degree is the least severe type of burn. They are reddish in appearance and may swell a little. When you press the skin, it turns white. Healing time is usually 3-6 days. Second degree : 2nd degree injures the skin’s top layer and tissue. The skin looks red and blistered and may be very swollen. This usually heals in 2-3 weeks time. Third degree : 3rd degree burns are the most extreme type of burn as injuries include all the skin layers. The skin appears white and charred and a little pain may be felt because of the damage to the nerves and tissue. Shock and chest pains may be associated with person who experiences this and it usually takes a long time to heal. All types of burns should be dealt with properly regardless of its severity to avoid infection as well as scarring. 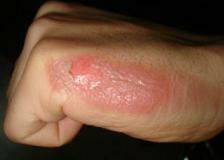 Follow the steps below on how to cure second and third degree burns using home remedies and other professional help. For second-degree burns, the first thing to do is to immerse the burn in cool water for atleast 15 minutes. If the burn area is small, say in the hand, you can apply cold compress on the part, but do not put ice as it may damage the skin further. Second, apply antibiotic ointment remedy as instructed. Third, always cover the burn with a dry and non-stick dressing and change the dressing everyday. Fourth, let the blisters break by themselves. Fifth, the burn area may be itchy as it starts to heal, be sure to cut your fingernails short to avoid injury on the area. Finally, one should prompt medical attention immediately. For third-degree burns, one should go to the hospital immediately. Never take off the victim’s clothes which are stuck on the burnt area. Moreover, do not soak the burn or apply any antibacterial ointment. Finally, cover the burn with a cool and moist sterile bandage until you’ve transported the victim to the hospital. That is how to treat second and third degree burns. A last piece of advice though is to never put lotion, butter, or other creams in serious burns as they can further aggravate the situation. Burns are terrible. I saw Travis Barker endure a couple of burn surgeries. Too bad!